Take a look at the latest works of FAST FORWARD or contact them in Hamburg directly. Find on Production Paradise the best creative professionals and production services for expendables, location service and scouts, lofts and houses, mobile units/ location vans, mobile units/ location vans, other locations, production rentals, production rentals. Each production needs its individual and perfect places. It is our ultimate goal to find these places for you. We offer a high-class portrayal of the location from presentation to service. With passion we attend to research and it’s adequate presentation. 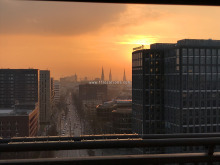 As a start we are specialized in the area of Hamburg and the northern Germany. If we don’t find a suitable location in this area, we surely scout national and international regarding your visions. You can already find locations from other parts of Germany and the world in our archive. "Hamburg meets New York - get rid of exorbitant travel expenses by finding the Big Apple right on your doorstep!" Featured in this Showcase, FastForward presents locations from Hamburg which look like they could be straight from New York City. The company recently welcomed clients who took advantage of staying in Hamburg, but were set on presenting 'New York', including Maybelline and a new campaign for JPS (location scouting by FastForward, production by nu projects). Delivering locations that range from the unique to the mundane, the company's team works around the clock to fulfill its clients' vision. Through hard work and diligence, FastForward takes great pride in calling Element-e, Markenfilm GmbH, Mr. BOB Films GmbH and Black Pearl Film GmbH loyal clients.